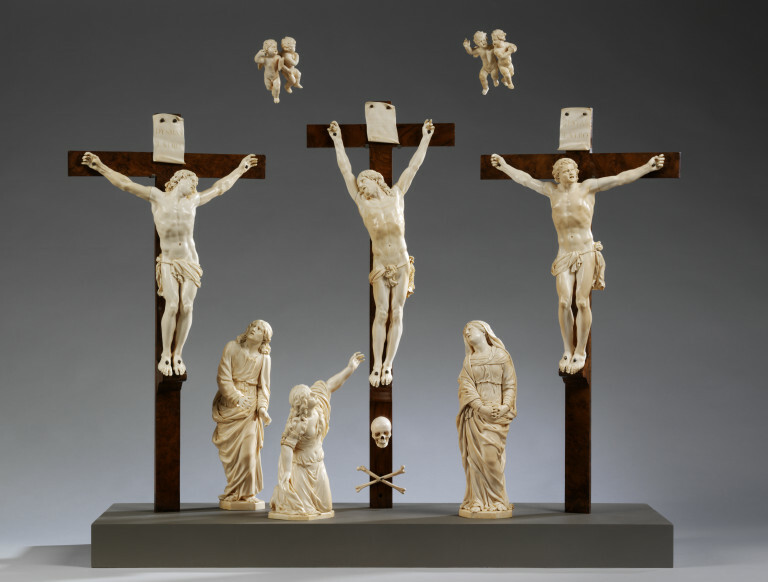 This ivory Crucifixion group is made by Pierre Simon Jaillot in France in 1664. Jaillot (1633-1681) is well known from various documentary sources, largely because of his dispute with Le Brun, Louis XIV's artistic adviser. He was admired above all for his crucifix figures. This group was probably intended as an altarpiece for a private chapel. It is one of the few documented examples of French invory carving in the 17th century, and is exceptional among baroque ivories in forming a complete ensemble. Another crucifix by Jaillot was recorded at Ailles in the late 19th century (Cherrier 1899), but is now lost. The present piece is the only signed and dated piece known by him, and is regarded as his most ambitious work. Commentators in the 18th century referred eulogistically to Jaillot’s sculpture, and the anonymous author of Mémoires secrets, published in 1787, noted the sublime character of this Crucifixion group, as well as the Jansenist manner in which Christ’s body was suspended from the cross, his arms almost vertically above his head. It was reproduced in an engraving by Etienne Picart after a painting by Louis Licherie, first published in 1821 (Baker 2011). An unattributed ivory figure of the Good Thief, the only survival from a lost crucifixion group, which is now in the Louvre, is thought to be French and to date from c. 1650. It shows stylistic analogies with the present group. 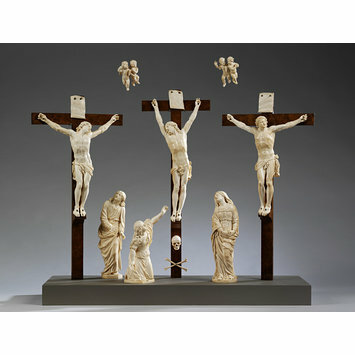 The group of figures consists of the Crucified Christ on a later walnut cross with an ivory scroll inscribed in Hebrew, Latin and Greek, and ivory skull and crossbones; the Good Thief and the Bad Thief, each with a scroll inscribed; the sorrowing Virgin; St. John the Evangelist; the kneeling figure of Mary Magdalene, and two pairs of angels to be suspended above the group. Signed. Bought from Sotheby's (sold by Mrs Johnson Polana Jasna, Princeton NJ, USA) for £94,775, in 1984 (with a grant of 10,000 from the Arts Fund). Formerly Curé of St Germain l'Auxerrois, 1787; M. de Meynard, probably Paris, 1900; Fernard Robert, Paris, May, 1903; Formerly it was acquired by Lord Astor in 1903, then sold at the Hever Castle sale at Sotheby's on 4 May 1983 (lot 332) when it was purchased by the above American collector. Export was blocked following a meeting of the Reviewing Committee on the Export of Works of Art, 18th August, 1983. The dying Christ is flanked by the Good Thief and the Bad Thief. At his feet are the grieving Virgin, St John the Evangelist and the kneeling figure of Mary Magdalene. The group was probably made for a private chapel. Probably intended as an altarpiece for a private chapel, this group is one of the few documented examples of French ivory carving in the 17th century. Jaillot is best known for his ill-advised and acrimonious dispute with Louis XIV’s artistic advisor, Charles Lebrun. e appears to have worked primarily in ivory but the large scale of the figures in this group the suggests the close connections of his work with French monumental sculpture by artists such as Girardon.